*gulp* Your stomach realizes that it’s a hollow cavern, and that THING ON THE SCREEN is the only thing that will satiate it! This happens to us Kdrama fans all the time. We see something in a drama that looks unbearably delectable, and we. must. devour it. So believe me when I say that I had a hard time only picking five tasty treats to share in this post. I know this looks like sushi, but don’t be fooled! 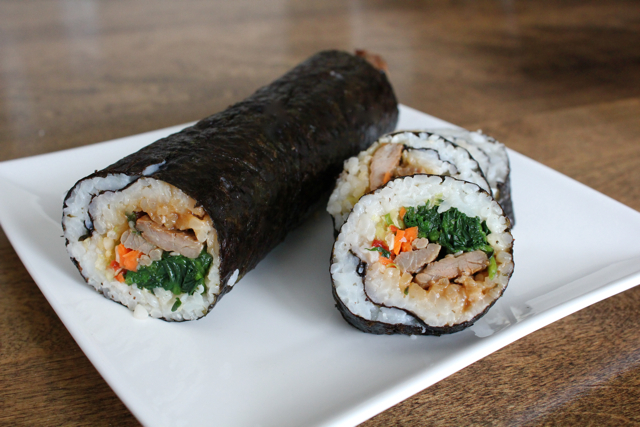 Kimbap is basically like a fancy Korean sandwich, and you see it in dramas when they are eating lunch, or going on a picnic, or want something fast and easy to eat. I think the most appealing part about kimbap is that you can pretty much put whatever you want between that rice and seaweed wrap. My hankerings for this munchy munchable increased ten-fold when I was watching Healer. Ajumma really sold that kimbap to me. Obviously. I mean, come on, everyone in Korea eats it, and it seems to go with everything. That delightful crunching sound the characters make when they’re munching on their kimchi? OH EM GEE I want it so much! Especially if I can make it with Lee Min Ho. I wouldn’t complain about that scenario. By the way, I found that kimchi is an acquired taste for me. I was overwhelmed when I first tried it, but now you wouldn’t catch me without it when I’m eating a bowl of ramen. 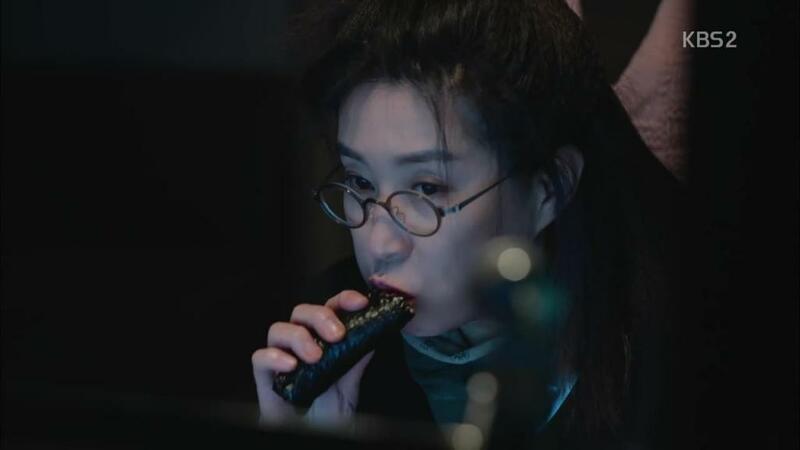 Every time I see a character scooping up those black, chewy, slurpy noodles, I want to leap through the screen and steal their chopsticks right from their hands. IT LOOKS SO GOOD. This seems to be the “Big Mac” of Korea. It’s fast, it’s fairly inexpensive, and apparently, it’s awful for you. It’s really not a Kdrama if there isn’t a ramen scene, right? And while I know we have access to ramen here in the states, we don’t necessarily have Kdrama ramen. Theirs looks so delightfully spicy, so salty and red and satisfying, that I just know I’m missing out on something. Turns out, I was right. My friend from Korea brought a giant box of food with him, and with it? Yup. Ramen. It was so good that it ruined “American ramen” for me entirely! No wonder they eat it so often. Also, anyone else really want to eat it in one of their convenience stores, with the bar stools in front of the glass-front windows? Yeah. Sign me up for that. I think the best thing about seeing bibimbap in Kdramas is the fact that it is always eaten with ginormous, ladle-sized spoons and shoved into people’s mouths in a perfect spectacle of gluttonous feasting. Characters eat bibimbap when they are emotionally unstable, or half-starving, or in a “who gives a flying fart, let’s just get fat” mood. It’s the emotions on their faces when they shovel that orange cacophony of side dishes and rice into their open mouths that makes this my number one must try Kdrama food. And I did of course. It’s mind-blowing. And that does it for my top 5 Kdrama “must try” foods. There are many, many more, and I will have to do a follow-up post to this one, because it was dang hard to choose only five. What Korean foods have you wanted to try? Any favorites? Let me know in the comments! 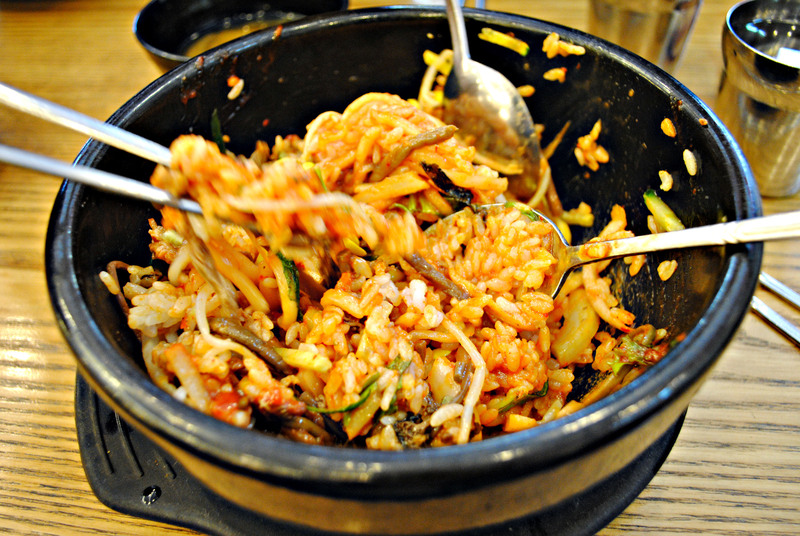 This made me crave for everything~ I’ve always wanted to try ddeokboki! Oooohhh that’s a good one! I LOVE ddeokboki! Yes!!!! It looks so good! I want to try everything. After watching city hunter I tried making kimchi on my own learning from a youtube channel called maangchi. I’ve seen that channel before. You’re brave for giving it a go! Omglob the fried chicken they eat in that drama!!! I wanted it so badly. Yes, exactly! A lot of this I have tried in restaurants, but bibimbap shows up on our family dinner menu from time to time, and I made jjajangmyun for the finale of My Love From Another Star, haha! I did try a soup once, but my grocery store didn’t carry all the ingredients. I have to hike to Chinatown in Philly or H-Mart if I want to find everything I need!